← Do FriendFeed Comments Hurt Bloggers’ Ad Revenue? 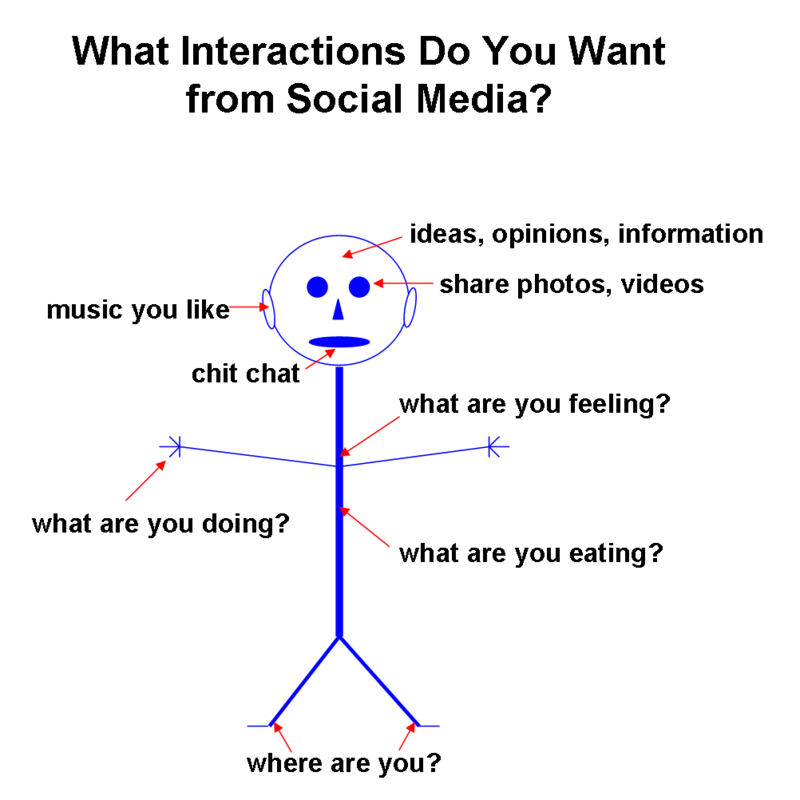 What Interactions Do You Want from Social Media? Now…where to go to get those interactions? An incomplete list follows. Personally, my interest is in ideas, opinions and information. But some photos and chit chat are also nice. 14 Responses to What Interactions Do You Want from Social Media? I like the stick figure. That is a cool graphic. @Eric – Twitter and FriendFeed both have that. FriendFeed lets me see people’s Last.fm selections. But I wanted to talk about where the relative strengths of the different social media companies are. @Shey, Franklin – you like the high-end professional graphics employed around here? This blog prides itself on bringing you the finest graphics anywhere. Love the stick man – Great breakdown! The graphic is outstanding! Kudos to you! Love the graphic. I would add Kutano to the list of where to go for ideas, information adn opinions. It’s new but it’s cool. Nice post. I think I’ll write a blogpost about my interactions based on your stick figure. Interesting you still use FriendFeed. I love FF, but stopped using it when it was bought by FB and they stopped developping it. Well, I used to use it a lot. Not so much now. That post was a couple years ago.